It is March, and boy is this going to be a packed month! We had Read Across America Week that just past, here is a picture of my son for his Dress Like Your Favorite Seuss Character! I found the crazy blue hair at Party City and was so excited! It was also Poem in your Pocket day, he had so much fun! We also have Easter and Spring Break coming up so I don’t know about you but I could use some extra TpT money to spend on some awesome resources! So I am linking up with Kelly Malloy @ An Apple for the Teacher for her monthly gift card giveaway! 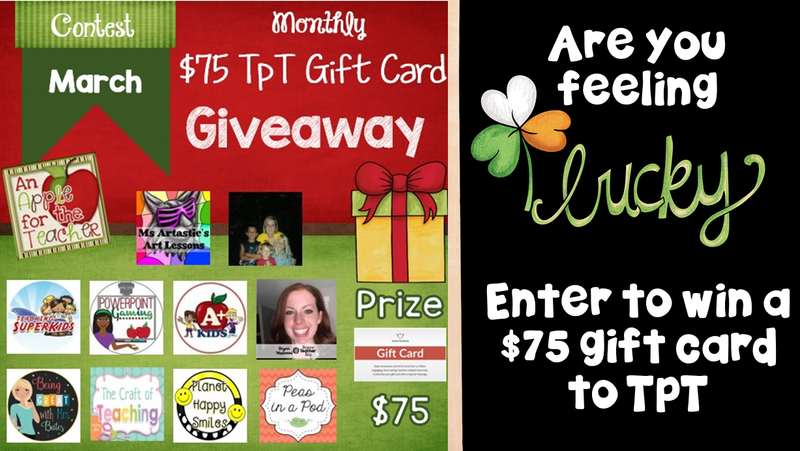 You could be this months lucky winner and take home a $75 gift card to spend on ANYTHING TpT related! I am so thankful for you all and would love for my readers to be the lucky winner. All you have to do is enter below! My fingers are crossed! I have also decided to give away a resource from my own store this month as a way of thanking you. One lucky winner will be able to pick something from my store (bundles excluded) and I will email you the product! All you have to do is comment below with the product of your choice! Thank you all so much and may the Luck of the Irish be with you! Thank you for the awesome giveaway! I would love your Question of the Day file! I have been wanting to do a question of the day for awhile now but could never find a product I liked! I like that yours is editable! Thank you Heather for entering, fingers crossed! Thanks for the giveaway and this opportunity! I’d like your Dictionary pack. This would be very helpful for my students as they expand their vocabulary! Thank you Mary for entering! I love using the dictionary, helps with the “how do you spell?” all day long. Thank you so much for this opportunity. I am always in need of new resources. I would love to have your binder covers. I am wanting to organize my supplies and those would be fabulous. Brittany, thank you so much for entering! Those binder covers have save me so much time over the years! Thank you for sponsoring these giveaways! Your Teacher Binder Covers would save a lot of time! Thank you so much for the giveaway! I would love to get your Do a Dot resource. This would especially be perfect for my daughter who is starting kindergarten in the fall. I would love to have these newsletter templates.